Next week the 16th Annual HR Technology Conference & Exposition kicks off in Las Vegas (October 7-9 @ Mandalay Bay). We’re excited to announce that CMS iRecruit will be attending this year’s EXPO, with our colleagues from EBS PaySuite. Visit us at Booth #49. Follow the conference virtually on Twitter with the hashtag #HRTechConf. Employee Based Systems is full service software consulting firm and software development company specializing in the design, implementation, and support of Time and Labor Management, Human Resources, and Payroll software solutions. With over 18 years in the industry, and a seasoned staff of developers, consultants, and technical support personnel, Employee Based Systems is the premier choice for all your software needs in these areas. 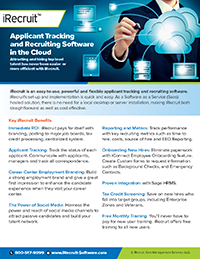 iRecruit is a cloud-based recruiting and applicant tracking software application that allows you to track and report on all of your job applicants and positions. Find out more and take a quick screenshot tour on our website at http://www.irecruit-software.com/ or join a demo on Tuesdays or Thursdays at 2pm. Call iRecruit at 1-800-517-9099 if you have any questions. This entry was posted in Blog, Events, iRecruit Blog and tagged HR Technology. Bookmark the permalink.